London Mayor in attendance as thousands gather at Trafalgar Square to celebrate Festival of Lights. 7,000 Londoners on Thursday evening joined the Mayor of London, the Jewish Leadership Council, Chabad Lubavitch UK and the London Jewish Forum to celebrate Hanukkah in the Square, the biggest annual Hanukkah celebration in the UK. 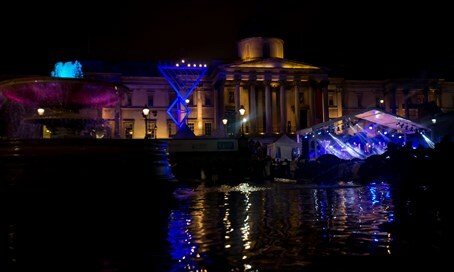 Set in the landmark location of Trafalgar Square, the celebration included the lighting of the largest menorah in Europe as well as musical entertainment and addresses from the Mayor of London Boris Johnson, the Chief Rabbi and Louise Ellman MP. The celebration featured vibrant musical performances from The Maccabeats, as well as the Neshama band and Akiva School choir. 6,000 free sufganiyot (doughnuts) ensured that the atmosphere stayed strong throughout. The celebration allowed the Jewish community to celebrate Hanukkah in the heart of the capital, something that is particularly poignant this year following the terrorist incidents that have affected the Jewish communities of Paris, Copenhagen and Israel. Johnson recently visited Tel Aviv, where he lashed out at boycotters of Israel, saying, "I cannot think of anything more foolish than to say that you want to have any kind of divestment or sanctions or whatever or boycott, against a country that when all is said and done is the only democracy in the region, the only place that has in my view a pluralist open society." Joe Vinson, the Director of the London Jewish Forum said, “I'm so pleased that Chanukah in the Square was once again a great success this year. The Jewish community turned out in their thousands to enjoy the festival of light in one of the world's most famous landmarks, in a wonderful celebration of Jewish culture. The Maccabeats certainly went down well too! “London Jewish Forum has been overwhelmed by the support offered by politicians such as Boris Johnson and Louise Ellman, and we hope Jews in London and across the world have a Happy Hanukkah," he concluded.